We had our first cold snap this weekend and after waking up to a low of 43 degrees on Sunday morning, the mood hit me to make a big pot of something warm and comforting. After some consideration and an inventory of the refrigerator, chicken gumbo jumped to the top of the list. I’ve written before that my family has ties to south Louisiana and Cajun and creole food. My mother’s sister and her family lived in the Lake Charles area, and every summer we made the drive for a visit. It was there at an early age that I was exposed to the cuisine of the region. I was an adventurous eater even as a youngster, and I was always up for trying foods that seemed exotic to me at the time. I devoured crawfish, gumbo, jambalaya, and étouffée every chance I got during our visits. Gumbo always starts with a roux, which is simply browned oil and flour. This step requires constant stirring for about 10 to 15 minutes so as not to burn the flour. Some people like a very dark roux which gives the gumbo a more intense flavor. I prefer roux to be somewhere between chocolate milk and a brown paper bag in color. Once you’ve made the roux and done the prep work, the gumbo comes together easily. Gumbo can contain any number of ingredients. In the past, I’ve posted variations on this dish, including Duck and Sweet Potato Gumbo and Seafood Gumbo. Because it’s fall, I wanted to add some seasonal flavors to this recipe, so I included some butternut squash and sage into the mix. After I had the gumbo cooking, I decided to put a little twist on this dish and make individual pot pies. All I needed was a little pie crust and some soup crocks. The result served its purpose as the perfect comfort food for a cool autumn night. 1. In a large Dutch oven or heavy soup pot, heat oil over medium high heat. Add 1/2 cup flour and whisk to combine. Reduce heat to medium, and continue to stir constantly. After about 10 to 15 minutes roux will begin to brown. Continue whisking until roux is between the color of chocolate milk and a brown paper bag. 2. Add onions, bell pepper, celery, and garlic to roux and stir to combine. Continue cooking, stirring regularly for 5 to 7 minutes. Add additional 2 tablespoons flour and stir to combine. Cook for 1 to 2 minutes. 3. Add chicken stock, tomatoes, sage, bay leaves, salt, and pepper to vegetables and stir until well combined. Reduce heat to a simmer and continue cooking for 10 minutes. Add butternut squash and continue simmering for 10 minutes. 4. Add chicken, sausage, and okra and simmer for 15 minutes. Adjust salt and pepper to taste. Remove from heat and cool completely. 2. Transfer flour, baking powder, and salt to the bowl of a food processor. Pulse to mix. Add cold butter to flour mixture and pulse 8 to 10 times until butter is the size of small peas. 3. With processor running, add water slowly until dough comes together. Dough should form a tight clump with pressed together in your hand. 4. Remove dough from food processor and knead several times on a floured surface. Cut dough in half and form two 4 inch disks. Wrap in plastic wrap and refrigerate for 30 minutes. 2. Ladle cooled gumbo into 6 to 8 crocks or oven safe bowls. 3. Roll out dough on a floured surface to about 1/4 inch thickness. Cut circles of dough 1 inch larger in diameter than the diameter of the crocks. Brush outside rims of the crocks with egg wash. Carefully place dough on top of crocks, pressing overhang around the side. Cut 3 vents in the top of the dough and brush dough with egg wash.
4. Place crocks on a large baking sheet and transfer to oven. Bake for 30 to 35 minutes or until crust is golden brown. Remove from oven and serve immediately. Awesome pot pie! I actually have never tried gumbo before. This looks super tasty! And that cute leaf design makes the pie look extract cool! I love the butternut squash addition. Sounds so hearty. Just the thing for fall. Love the temptations too! I’ve never had chicken gumbo in a pot pie! Brilliant idea — very creative. Thanks! Love how healthy yet indulging this dish is!! Perfect fall treat! Thank you, Ami! I appreciate your dropping by! This looks great and your photos are beautiful. I was wondering…what should I substitute for okra? I really am not a big fan of it. Any suggestions? Thank you so much, Peggi. I really appreciate your visit to SBD. You could just omit the okra and it would be fine. It will still have a lot of flavor without it. Absolutely brilliant, is all I can say. As always, gorgeous photos. 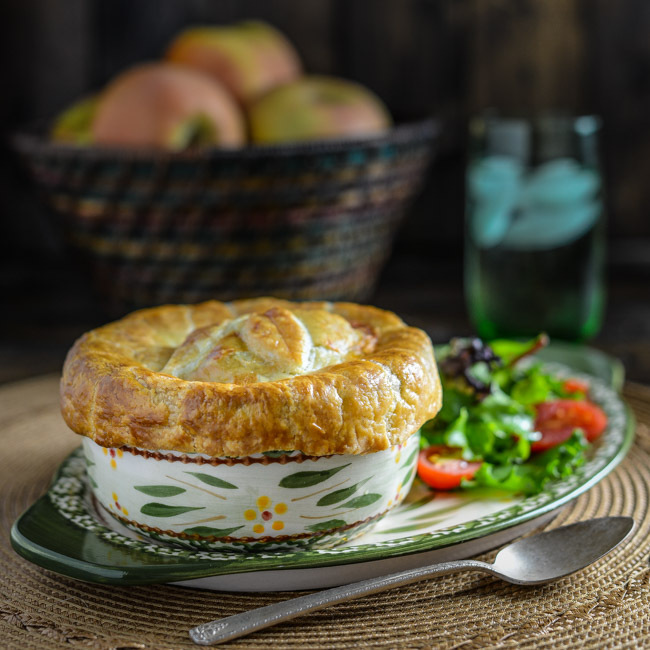 How delicious are these pot pies! Definitely a recipe that I need to recreate, they are perfect for the weather here in Australia right now. Great recipe & pinned! Oh wow this looks way too good! !